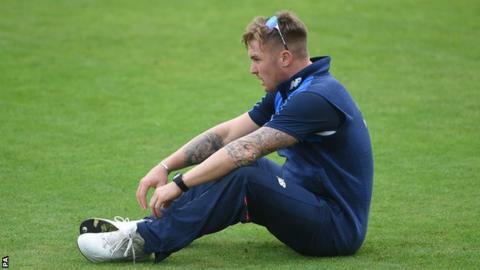 Although Eoin Morgan has not confirmed that Jason Roy has been dropped, it was pretty obvious to all who saw England's training session on Tuesday morning what will happen in the Champions Trophy semi-final against Pakistan. Jonny Bairstow, Roy's likely replacement on Wednesday, went in to the nets first and Roy, who did not bat until after the rest of the team, was dispatched to throw balls back from the long-on boundary. It was a brutal fall from grace. Before this tournament began, skipper Morgan said he could not see a scenario where Roy would be left out. It was a bold statement. It is quite right that every player is supported, but there also has to be fairness and integrity in selection. Roy has made only 68 runs in his past nine one-day international innings and, even though we can sometimes be a little soft over dropping players, it is time for a change. Roy, the Surrey right-hander, is a good player. He will be back in England's plans, probably in the Twenty20 series against South Africa later this summer. However, he was making bad choices and not giving himself the chance to score runs. Against Bangladesh he played a pre-meditated sweep and was caught at short fine leg. Against New Zealand he moved too far across his stumps and was bowled. So, even though England are entering the semi-final of a major tournament, it seems right that a change is made. Even though Bairstow has not batted in a match since the third ODI against South Africa, he is not the sort of character who will be fazed. He is not a natural opener but has been batting at the top of the order for Yorkshire and made 174 against Durham in the One-Day Cup in May. Still, he faces a tough task. To possibly opening the batting against a talented Pakistan pace attack with a white ball at 10:30 in the morning is not easy. Bairstow will have to give himself a chance to get in. If he does that, he scores so freely that there will be plenty of opportunities to catch up later on. If the questions over Roy and the top of the England order remain, then Morgan's bowlers have certainly answered any doubts there may have been before this tournament. Liam Plunkett is the tournament's second-highest wicket-taker, a fully fit Mark Wood is running in hard in the middle overs and leg-spinner Adil Rashid, surprisingly overlooked for the opening game, has been terrific. Rashid is showing the value of the investment that England have made in him since the 2015 World Cup. He bowls an excellent googly, one that even the best batsmen have trouble reading. Morgan has plenty of options and the skipper is having an excellent tournament, not only tactically but with the bat. He said beforehand that it is a weight off a captain's mind if he isn't worrying about his form because that is one kind of pressure that isn't allowed to build, either in the dressing room or in the media. Without that problem, Morgan is scoring runs and guiding his troops through the tournament. When he leads, he appears incredibly calm, even if he isn't inside. And so England turn to Pakistan, who will be full of confidence after winning a tight game against Sri Lanka on Monday to qualify for the semis. That game was full of mistakes - poor shots and fielding errors. That is what can happen when the pressure is on and the match actually means something. Pakistan are a team that have flair and a knack of lifting themselves in big tournaments. However, I've seen nothing to suggest that England will lose, other than this is one-day cricket and the wheel of fortune can turn. Having said that, if England end up batting first and put on a big total, the heat really will be on for Pakistan. England are aiming to win their first global 50-over tournament and now find themselves two games away. One chance they did have for the elusive major honour was the 1992 World Cup final, when they were beaten by Pakistan. I was commentating that night in Melbourne and saw Wasim Akram produce an amazing spell of swing bowling. Earlier in the game, Javed Miandad could have been lbw to Derek Pringle, a decision that went Pakistan's way and was quite crucial to the outcome of the match. Pringle drones on about it and, after seeing it many times, I have to concede that he's probably right. England have not played Pakistan in a knockout match since then. A quarter of a century on, it might be time to put it right. BBC cricket correspondent Jonathan Agnew was talking to BBC Sport's Stephan Shemilt.